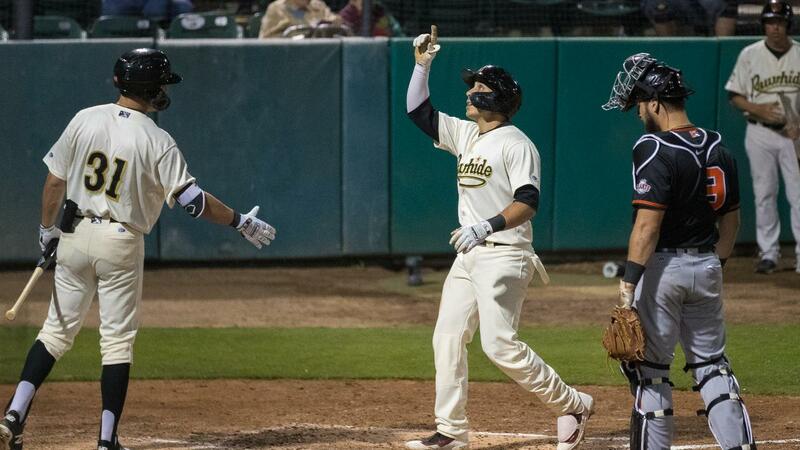 Visalia, CA- The Rawhide scored first in the bottom of the first inning after Jose Caballero doubled and Yoel Yanqui hit an RBI triple to score Caballero. In the bottom of the third, Carlos Sano came in as a relief pitcher for the San Jose Giants' starter, John Gavin . Gavin took the loss after giving up two hits, three walks, and 1 run. In the third, Visalia's Renae Martinez hit a solo shot to left-center for his first hit of the 2019 season to extend the lead to 2-0. The Giants would not answer back until the top of the fifth inning. Josh Green , who got his first professional start, found himself with bases loaded and nobody out. Bryce Johnson grounded out for the first out of the inning, but it drove in Jean Angamos to cut the deficit in half. Manuel Geraldo then singled to shallow right-center field to score Orlando Garcia and tie up the ball game. Green got Heliot Ramos to ground into a double play to end the inning. That would be the night for starting pitcher Green, who got a no-decision but pitched 5 innings, giving up 6 hits and 2 earned runs with six strike outs and one walked batsman. The Rawhide answered back in the both of the fifth when Camilo Doval came in relief for Sano. Martinez found himself up with runners on third and second with one out. He grounded out to second base, but it scored Mark Karaviotis to give the Rawhide a 3-2 lead. Luis Castillo entered the game for Green in the sixth inning. He gave up the lead when Ryan Kirby hit a solo shot over right field to tie the game up. The game remained tied through the ninth inning. San Jose's Marlique Ziegler started the tenth inning as the runner at second base. Matt Brill was the Rawhide pitcher after entering the game in the ninth inning. Bryce Johnson singled to send Ziegler to third with nobody out. Brill then struck out Geraldo, Ramos, and Joey Bart to keep the score tied 3-3. Camden Duzenack started the bottom of the tenth inning as the runner at second base. Karaviotis walked with one out and then the Giants intentionally walked Yanqui to load the bases for Martinez. Martinez hit a sacrifice fly to right field that scored Duzenack to end the game. The final score of 4-3 marks the first win for the Rawhide in 2019. For the box score, click here.